Honesuki are Japanese boning knives, great for boning chicken and red meats but also amazing as a general purpose utility knife! 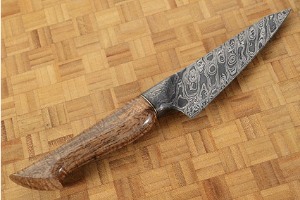 The shape provides finger clearance when working over a cutting board. 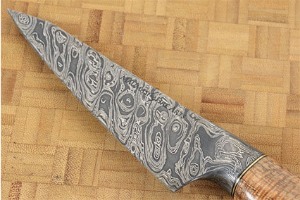 A gentle rock to the blade makes it an optimal chopping knife. 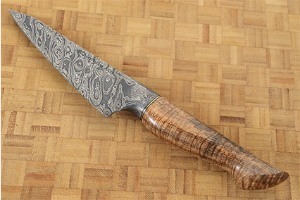 The thin, aggressive point makes it even capable of detail tasks where a paring knife would otherwise be used. 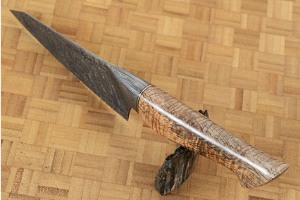 As is traditional, this knife has a right handed bias and is nearly flat on the left side and convex ground on the right. This assists food to release from the knife. 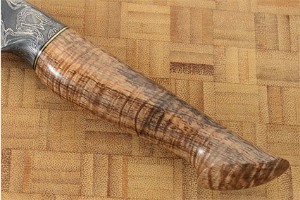 The handle is formed from a single piece of curly mango wood. 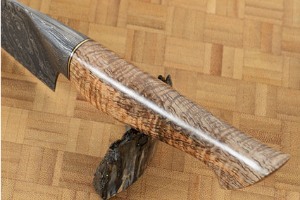 The workmanship is beautiful, and the wood chosen is gorgeous! The light toned wood has tremendous undulating curl with an underlying striated figure. Contours ensure a comfortable and safe grip. Alternating silicon bronze and black G10 spacers set between the handle and integral bolster assist the wood to adjust to temperature and humidity changes.